There are a ton of famous food marriages out there — spaghetti and meatballs, milk and cookies, bacon and everything — but what about best food friends? Really, no duo represents American cuisine culture better than hamburgers and hot dogs. The two have been BFFFs since "barbecues" became "BBQs." But when it comes to the world of fast food, the two are rarely seen together. 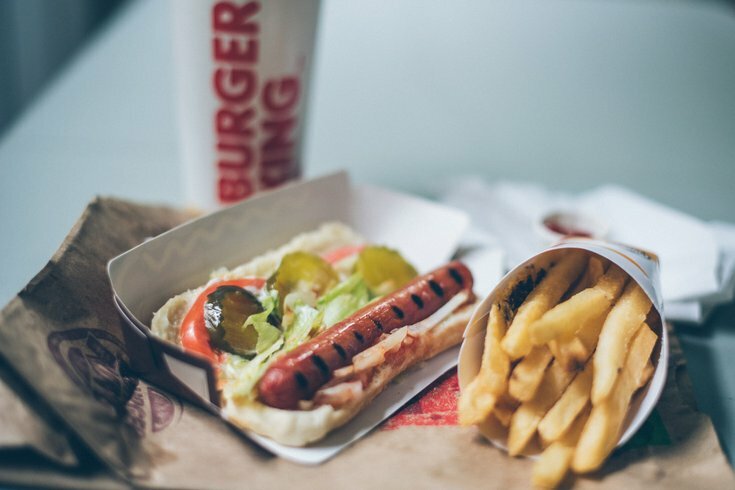 While burgers have remained the stars of fast-food society, hot dogs are often left weeping in the wings, relegated to the fringes, like Sonic and Checkers. Legendary McDonald’s CEO Ray Kroc actually forbade the sale of hot dogs under the Golden Arches, saying wieners did not meet the chain’s quality standards. Years after Kroc’s death, McDonald’s did sell hot dogs overseas in Japan and the U.K. for a time. Test runs in U.S. locations, however, never had much success. 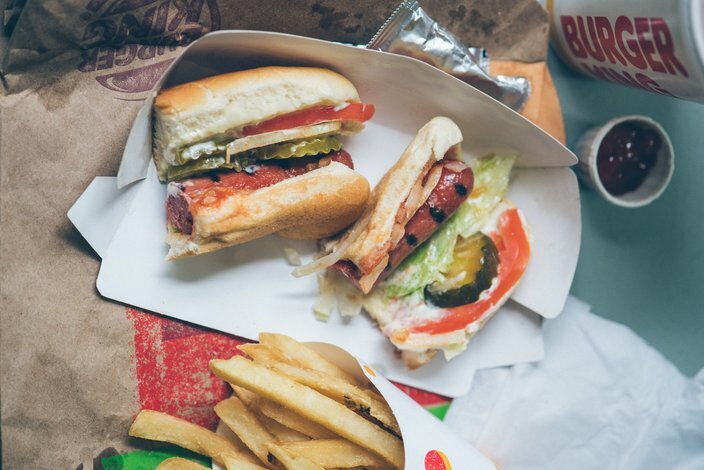 This is why Burger King’s new hot dogs were such a gamble. So far, it’s working out. The regular grilled dogs and chili cheese dogs have been a hit, with North American Operations President Alex Macedo telling Fortune that the addition was the biggest change to the menu since the debut of chicken in 1979. The company even launched the product with “training videos” starring Snoop Dogg and a Spanish-language version with Charo. The company’s latest grilled creation is the Whopper Dog. Basically, it’s everything on Burger King’s signature burger the Whopper, but placed on a hot dog. Would the King’s experiment work? I headed to the BK Lounge to find out if these dogs could cut the mustard. Since the quality of the food may change depending on location, I chose to go to the Columbus Boulevard BK in South Philly — it’s a Burger King I’ve come to trust. I ordered a regular burger Whopper in addition to the new dog version for comparison. Merriam-Webster takes on great Philly Twitter debate: Is a hot dog a sandwich? As usual, the Whopper was spot-on. I’ve always preferred it to its biggest rival, the Big Mac. (Mac-heads, feel free to voice your displeasure in the comments.) The Whopper’s beauty is its simplicity: mayonnaise, lettuce, tomato, pickles, ketchup, onions and a sesame-seed bun. Nothing fancy, just a time-tested blending of flavors that when presented in the proper proportions is simply exquisite. The lettuce-to-mayo ratio, in particular, is a feat — never too much, but never not enough. Soon, it was time to try the spinoff. The biggest difference between the two, aside from the meat choice, is the bun. While the Whopper Dog’s roll was unseeded unlike its predecessor, its buttery texture really added a lot to the overall package, which turned out to be delightful. The crispness of the tomato and onion was also an immediate highlight, along with the famous one-two punch of lettuce and mayo. But the star of the show was the hot dog, and it definitely (and defiantly) delivered. The King managed to grill a delicious all-beef wiener that has a smoky undertone reminiscent of an outdoor cookout, yet is also subtly sweet. It takes the familiar formula of the Whopper and transfers it, completely rearranging the taste in the process. Even with the added pressure of living up to its namesake, the grilled dog was an unexpected success. Verdict: While it’s not yet in the same league as the famous original, the Whopper Dog deserves a place beside its best burger buddy. Bad For You is Bryan Bierman’s (mostly) weekly column delving into the world of junk food, fast food, new food, weird food, candy and other edible guilty pleasures. Tell him what to eat on Twitter: @bryanbierman.